This site is designed to provide concise and easy to follow Bible info sheets, charts and reading plans all in free downloadable pdf files. Our motto > "Be concise and easily understood"
The Word of Jesus should be our guide for living. This one page chart and leaflet allow you to easily find the teachings of Jesus on many topics to help you make the right decisions in life. The DL leaflet download includes Jesus' Prophecies. The Bible Nomad will help you find essential and interesting Bible information. Many of the lists in this guide are not covered adequately in Study Bibles eg handy lists of Bible Symbols and Titles of God. The lists of Parables are much more exhaustive than most and also include parables from the Gospel of John which for some reason are missing from other lists. The prominent people and place names section is designed to bring together several authorities in the one place, which hopefully gives you a fair idea of the name meaning at a glance. You can view the Bible Nomad in A5 format on the link below. Feel free to save this pdf onto your computer for your future Bible reference needs. The link below is in A5 format. If you prefer larger print size you can print out this file in A4 and mount in a plastic display folder for easier reading. Select 'A4 page' and 'fit to printable area' in the page scaling area of your print menu. This selection of charts and info sheets present us with many of the key symbols used in the Bible. The first pdf download is a chart listing over 40 symbols, their meanings and where you can find them in the Bible. These sheets are presented to give the reader a concise and less complicated vision of Bible prophecy leading up to and including Jesus return and Kingdom. This reading plan presents many Bible themes by reading just one chapter per day over a 48 day period. It also comes with a quick reference to other important Bible info. All of this comes in a tidy guide that can be folded to 1/4 A4 size and used as a handy bookmark. This guide also comes in standard A4 portrait presentation. Here are two 365 day reading plans to choose from. The first plan divides the Bible into 7 themes with one reading from each theme per day of the week. The second plan divides the Bible into 3 sections with one reading from each section for each day of the year. Print the plans back to back and tri-fold. This plan can be used as a bookmark. 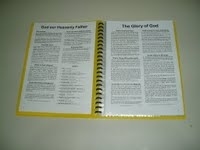 This guide is composed of 30 concise Bible info sheets, one topic per sheet. Each info sheet is presented in 2 column 'easy read' format. You can mount your guide in a 20 insert plastic display folder. 2. 'Interesting Bible facts' including some of the history of our English Bible translations. 3. 'The Bible said it first' showing how the Bible has influenced our day to day conversations. Each of these easy Bible meanings leaflets contain a chart describing in concise easy to understand language, 12 basic Bible teachings. These charts could be used for a short Bible course or as general handouts when printed both sides and folded as DL leaflets. The seven feasts of the Jewish sacred calendar take us on a wonderful symbolic journey in time. These feasts are symbolic of Jesus' life from His birth until He is King of Kings. The first four feasts speak of His first advent and the last feasts speak of His second advent. The Jewish seasonal calendar also takes us on a wonderful spiritual journey by symbolising the history of the church from the first century through to the future Kingdom of God. The Jewish seasonal calendar starts in Autumn when the plowing and seed sowing occur which are good symbols of the preaching and preparation of the early church. The Bible is responsible for introducing many phrases into our day to day conversations. These phrases have also been used for book and movie titles and some trade marks. This site contains over 200 of these phrases plus handy pdf leaflet downloads. Make use of the leaflet downloads for your friends as a unique way to introduce them to the Bible.